Richard Nahem’s talent as a photographer is similar to his talent as a blogger and tour guide. 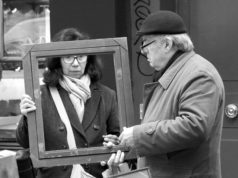 Richard has the ability to see what most of us cannot – and to surprise us with extraordinary beauty or curious detail in what to the rest of us might have seemed to be mundane. 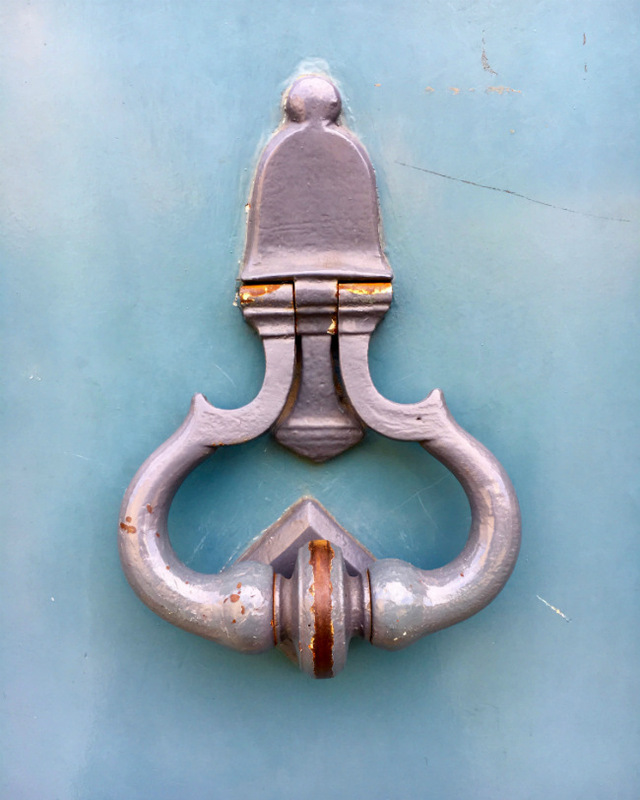 Particularly appealing are his images of the intricately carved or spectacularly colored doors found in 18th and 19th century buildings all over Paris– images he has been publishing on his blog for a number of years. 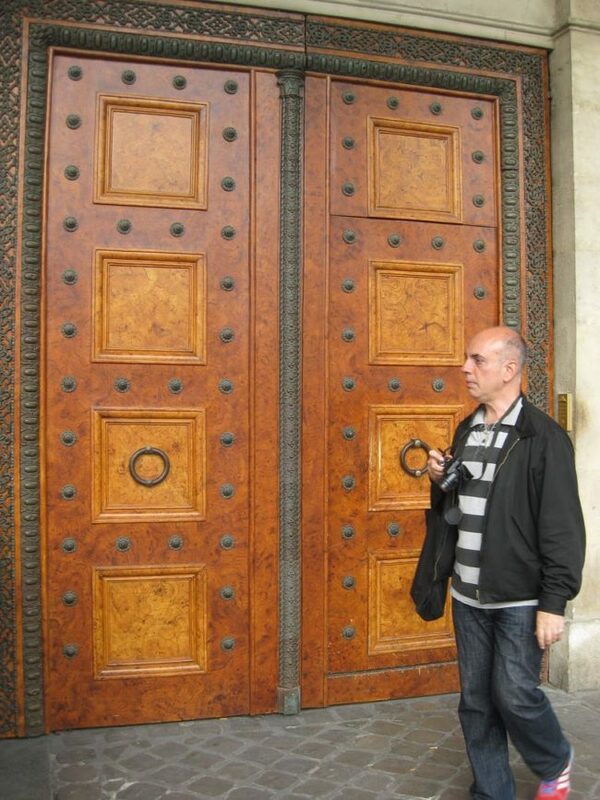 Some of his most interesting doors are those with layers of glass behind black metal strips, behind which you can see perhaps a Dalmation staring out, or a rose glow of unknown origin, or a small decorated Christmas tree. Iconic monuments are shot from unusual angles, or with unique aspects as affected by the seasons or the lighting. 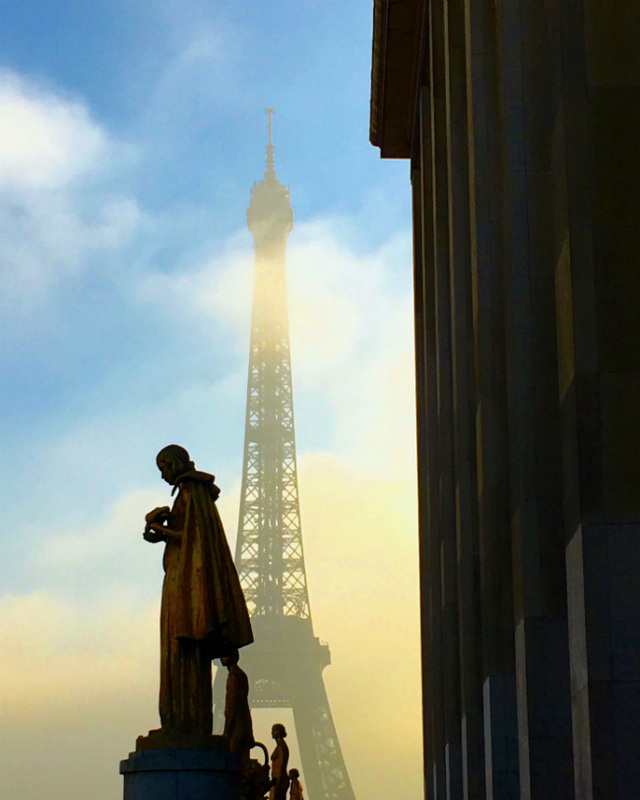 In one of my favorite Nahem photos, the Eiffel Tower appears behind the gold statuary on the Trocadero as if floating in a gold sky, while the statutes are no longer gold but appear in dark silhouette in the foreground; in another, the Tower is viewed over grey roofs through a rain spattered window at the Centre Pompidou. Fifty five examples of Richard’s images are now on display within the luxurious environs and mahogany woodwork of the Signature Literary bar at the five-star Hotel Pont Royal – a lounge which became, between the two World Wars, a favorite place for the likes of Zelda and Scott Fitzgerald, who held court with Hemingway, Sartre, and Chagall. 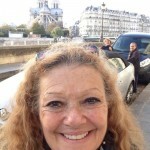 Richard has been photographing Paris since he arrived from New York in 2005 and has become known for his ability to wander the streets as a Paris flâneur and capture unique details on his iPhone or camera. He has a laser “eye” for color and texture and for the dramatic. 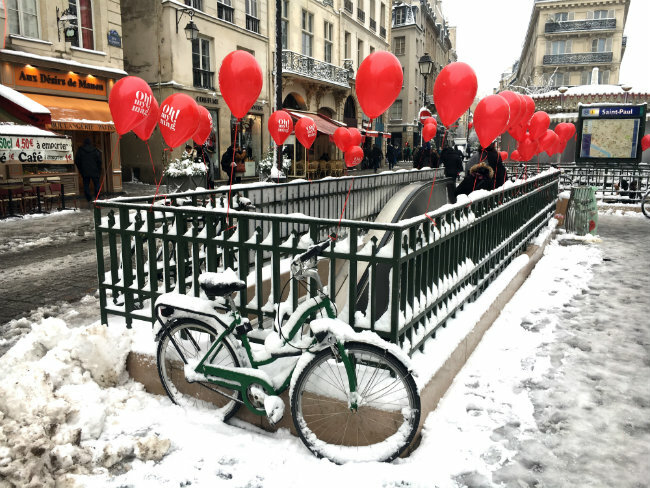 Pops of bright red hit your eye via a few balloons floating above the white and grey of a snowy landscape; or a bit of yellow from the gold triangle at the top of the obelisk at Place de Concorde jumps out from a grey overcast sky above hanging black lanterns; red chairs piled high outside a café form an abstract painting; torn posters and pocked walls on metro platforms form interesting abstract designs; and the intricacy of door knockers, shot up close, are a surprise. 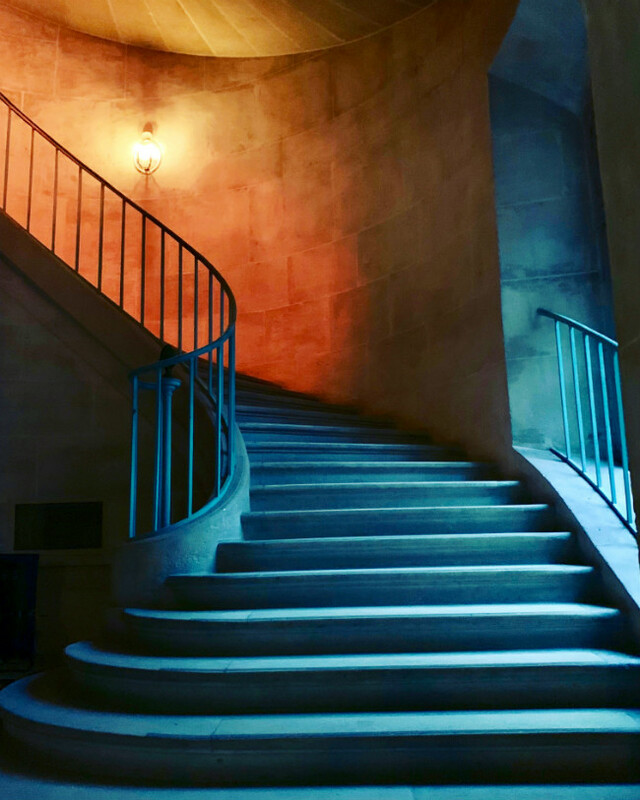 One of my personal favorites is a curved stairway at Versailles with the stairs lit in blue, climbing towards a shining orange wall. 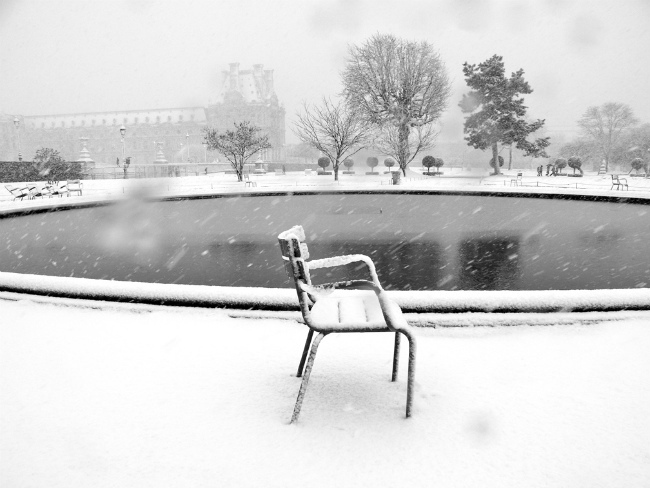 Another is a black and white image of a single snow covered metal chair left behind by its companions, alone in a snowstorm near a pond in the Tuileries, waiting for the return of Spring. The cocktail reception opening of the exhibit on February 5 was well attended and many guests gave glowing reviews of the show. 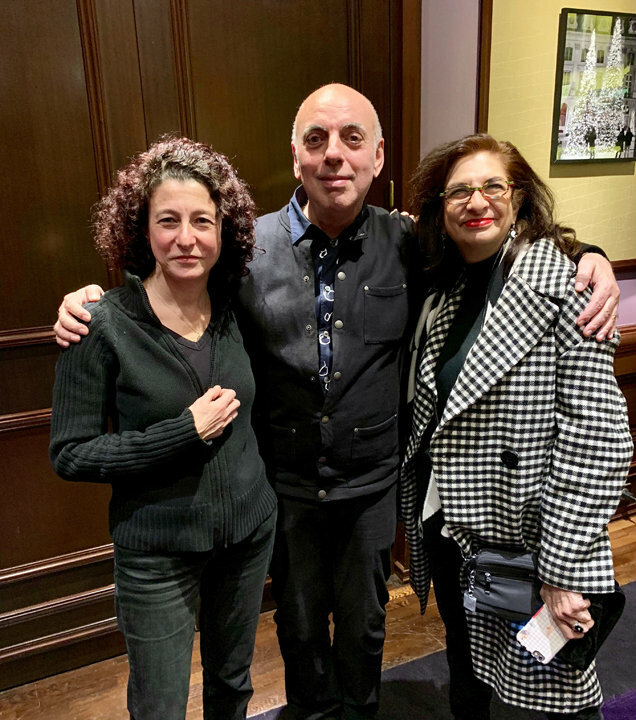 Michelle Gross, of Paris, shared with me that the venue reminded her of an English library in a giant mansion and that Richard’s attention to small details in the photos often rendered remarkable something that would otherwise be considered unremarkable. I spent an afternoon with Richard a number of years ago. 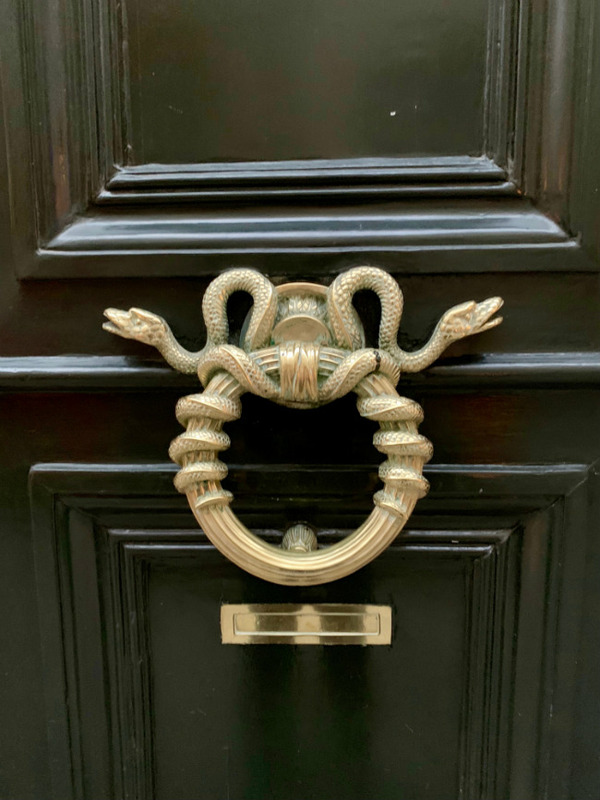 We were walking along the rue – ostensibly on our way to have lunch – but our forward movement was constantly halted by Richard finding something he had to shoot – including a gorgeous door that I had walked right by, which he insisted on shooting from multiple angles. Relax with a drink on a couch or in a leather chair, surrounded by the spirits of the early 20th century literati who frequented the bar and lounge, perhaps order some food available from the adjoining Joël Robuchon restaurant, and take your time to explore a rare and wonderful viewing of Nahem photos. 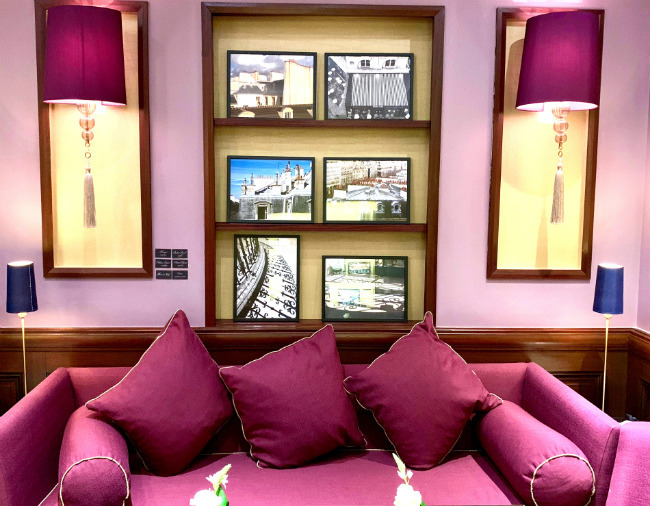 Framed photos can be purchased through the hotel desk for between 150 and 350 euros, or at a 20 percent discount unframed. The hotel will also arrange packing and shipping. 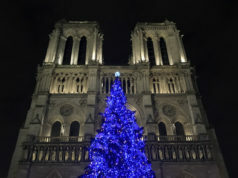 Hotel Pont Royal, 5-7 rue Montalembert, 7th. 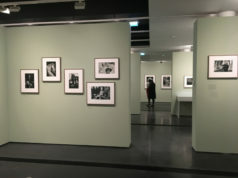 The exhibition opened on February 5 and is closing on March 31. 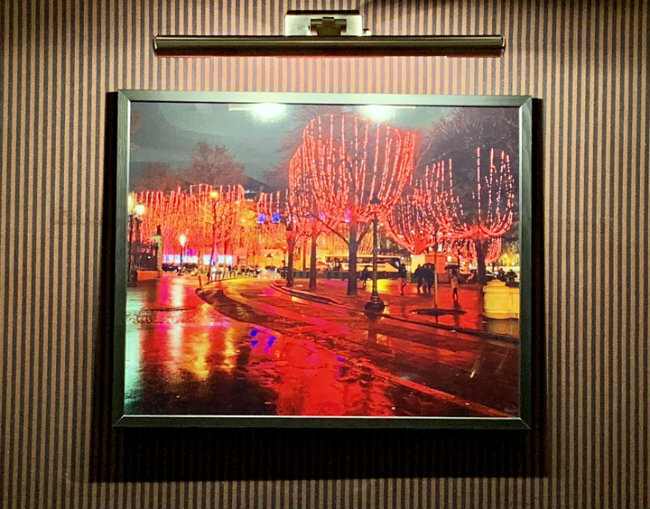 The Signature Bar is open seven days a week, and a selection of dishes can be ordered from the Joel Robuchon “L’Atelier” restaurant that is accessible from the hotel. Tel: +33 (0)1 42 84 70 00. Thanks for a great article Michele. You know I ADORE your photos Richard. 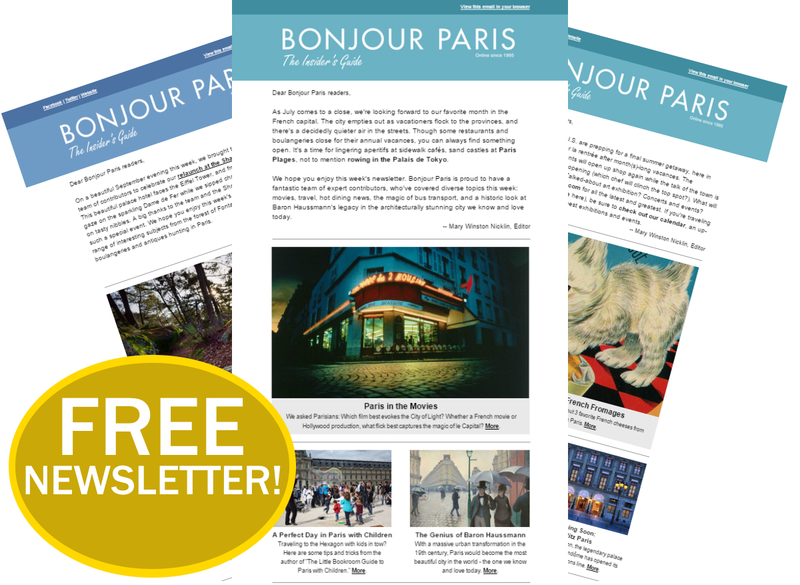 My heart flutters a bit each time I open “bonjourparis”. This Valentine offering was much more—like a rumble. 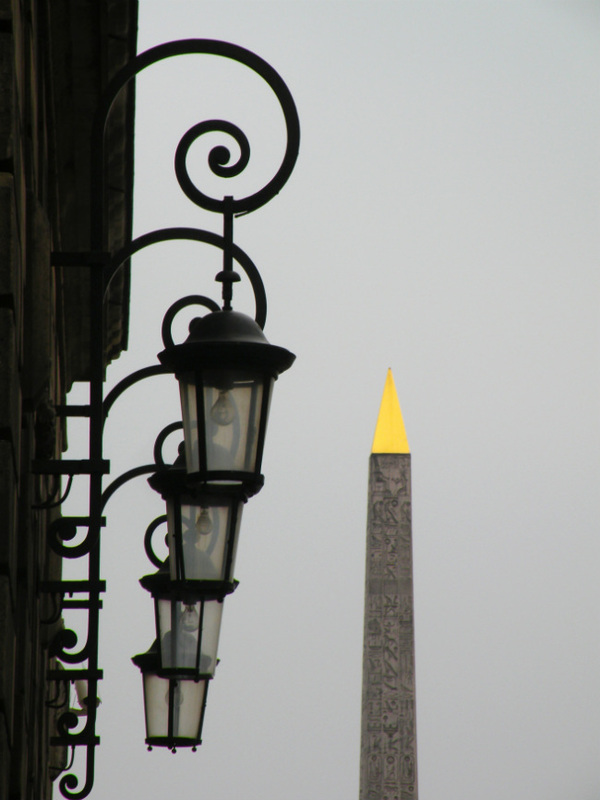 The photos bring Paris to me and capture what makes Paris truly a joy to behold. Ivwould love to know how long these wonderful photographs will be shown at this hotel venue? hello Kay Thanks for asking. The show will be up until March 31. We are in Paris March 31sst. Will this show still be up??? Please give dates of shows to help us plan better. hi Louise the show is up until March 31. Thanks for asking.